As many of you know I ran a 1/2 marathon this past weekend in my hometown of Wichita. I wanted to give you a run down (pun intended ... your welcome!) of how it went. I'll be the first to admit, for this race, I trained the least I ever had. I originally had a written plan of my training schedule and had high hopes to come in under two hours, which would have been a PR. My 1/2 marathon training and crossfit both began in July. After crossfit I just couldn't muster up the energy to run. Then after a month or two I just got lazy with my training (cone of shame moment). I'll be honest, my longest training run for this 1/2 was a whole whopping 5 miles. gasp! However, I did crossfit 3-4 times a week and it saved me on the 1/2. Crossfit builds some good mental endurance and it definitely helped during my run which overall, went well. I loved running through my hometown and Dave was a trooper and ran with me for encouragement. The biggest issue I had was my IT band flared at mile 3 and hurt the remaining 10 miles. I had to stop about 5-10 times to stretch my cramped leg and that darn leg slowed me down. I came in at 2:32 but for not training I think I did pretty well. Other than giving a run down on how my 1/2 went I wanted to share 5 race day tips with you. 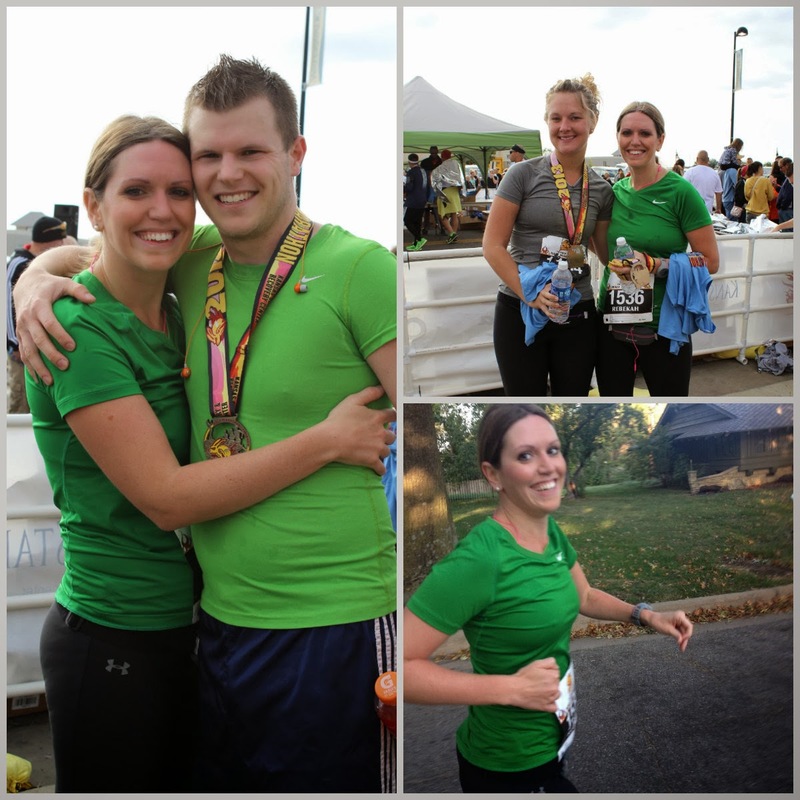 This 1/2 marathon was my 7th one and I think I've learned some good lessons along the way. 1. make up your mind - a few nights before the race you mentally need to go through your race, go over how well you trained, and tell yourself you will do it. Mind over matter is true. 2. have all your gear ready - No one wants to wake up race morning and search for their gear. Trust me, I've done it, and let me tell you ... I'm a scrambling panicked mess! After a few of those miserable mornings I made a list on my iPhone of everything I need. I have everything from shoes, my race bib all the way down to underwear and what earrings I'm wearing. Use that list when you pack for your race and the night before have everything sat out and ready to go. 3. food & hydration - 2 days before you need to start hydrating. Also, by hydrate I don't mean drink 5 gallons of extra water (that can be harmful). However do drink a bit extra water, drink juice and I even drink coffee. Also, eat a few extra carbs but don't over eat. You don't want to be at the porter potties on race day with the big 'D' from stuffing your face with a massive amount of carbs. 4. racing buddy - For me this one is crucial. I run so much better when someone is running next to me, especially distance runs. My work spouse ran my first full marathon with me and my husband ran this last half marathon with me. Every long distance race where someone runs with it goes so much better. Friends can provide encouragement to each other as well as give you that extra push to get to the finish line. I'd also recommend discussing how you best encourage each other. For example, the night before this past 1/2, Dave and I discussed that I would think positive and that he would give me positive reinforcement. If you discuss how you are best encouraged that will pay off on race day. 5. race day support - Recruit some friends to cheer you on. I know, it isn't fun to ask people to get up at 6am to come clap and cheer but it makes all the difference and they often enjoy it as well. When I ran my full marathon, my brother and Mom met us on a couple of different spots and my brother called my phone several times to check where I was at and to keep telling me to 'put one foot in front of the other'. This past race my sister-in-law found us on 3 different spots and had the family dog there to cheer us on. My sister was also there as well as several other people. Knowing people will see you on the course will help you stay running (you don't want to get caught walking) and they will motivate you to get to that finish line. So, there you have it, 5 race day tips. I hope they help. Have you run a half marathon? Have any good tips? I'd love to hear them. Ah! I forgot you were doing the Prairie Fire! I mean, I know you ran a half, but I forgot it was that specific race. My first half... actually my first race ever! Good times. The medals are really cool! Different from the one I got. For not really training, you did awesome! I'm running half #6 on Saturday, and I won't have anyone there to watch :( Sad day. I love Jordan (obviously), and he supports my running, but he's not INTO running, so I'm not going to ask him to wake up crazy early on a Saturday to watch me. This time, anyway. I'll need some mental toughness to get through! Congrats on your 1/2!! Great tips too!